The Marsha Brown Creole Kitchen and Lounge brings a delicious taste of Creole New Orleans to New Hope in Bucks County, Pennsylvania. 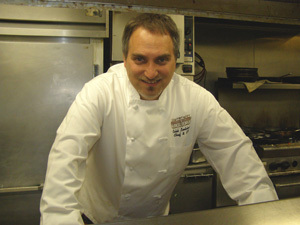 Caleb Lentchner, the General Manager and Chef, is in charge of the kitchen, which uses many of Marsha Brown's Louisiana family recipes. 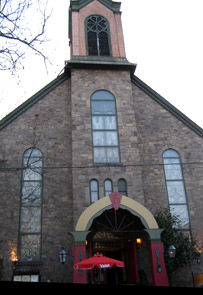 Located in a former Methodist church, the restaurant is a unique dining experience. Throughout the years, Edward and I have dined in some rather unusual places however dining in a former church was definitely a new experience for us. Prominently located on South Main Street, the exterior of the restaurant features large fork and spoon sculptures affixed to the building, while inside there are lovely stained glass windows and other gentle reminders of its former life. 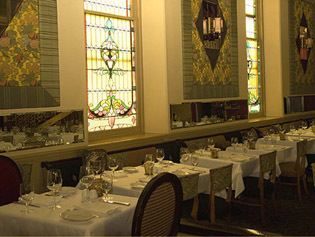 On the first floor, there is an intimate lounge and a private dining room, with main dining on the second floor, and another private dining room located in the former choir loft. A large painting is the focal point of the dining room, wood cushioned pews line the walls, needlepoint upholstered chairs flank the tables draped with pristine white linens, and sconces softly illuminate the room. In the former sacristy area, there is additional dining with oval red back chairs flanking the tables. At the beginning of April 2010, Edward and I had dinner at the restaurant, which we now deem as our "Taste of New Orleans" evening. Our waiter, George, began our taste by bringing us fresh hot, bread served in a white paper bag, New Orleans style, accompanied by butter and red bean hummus. Next came starters of Lobster and Shrimp Bisque, which was a thick and hearty stew with tiny diced carrots that had just the right hint of cayenne for spice, and was kissed with sherry; Crawfish Spring Rolls with Mardi Gras slaw made with thin julienne carrots, cabbage, chopped red grapes, pecans, and poppy seeds were a delicious East meets West pairing with a Creole dressing; and Mamére's Crab Cheese Cake which combined jumbo lump crab meat, cream cheese, and smoky Gouda cheese into a delectable savory tart with panko crust served with remoulade and green onion coulis. Paired with Frog's Leap Sauvignon Blanc from Napa Valley, California, the starters were a lovely introduction to the restaurant's vision. Edward continued with Prosciutto Salad that was made with baby spinach, fig and bleu cheese, tossed in fig vinaigrette, with layered prosciutto di Parma that was a lovely mélange of sweet and tangy flavors. I had the Fresh Beet Salad with thinly sliced marinated beets topped with a salad of baby spinach, fresh orange, goat cheese, and balsamic vinaigrette. For his main course, Edward had the Jambalaya, which could have been a meal all by itself, that was made with a mixture of crabmeat, shrimp, duck, and andouille sausage in a dark Southern roux blended with peppers, onions, and rice. He continued with a sensational 20-ounce bone-in Cowboy Ribeye prepared with a Bayou rub of 20 different spices and 1/3 sugar that was broiled in a 1500° F oven to create an almost crème brûlée coating, and crowned with sautéed sliced mushrooms and onions that clearly won his heart. 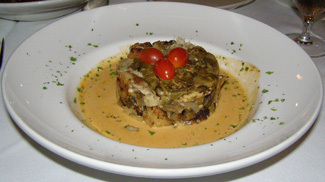 I had the Eggplant Ophelia, which was listed on the menu as Marsha's mother's favorite, that was a shrimp and eggplant casserole topped with grilled eggplant and baked until golden brown, and garnished with cherry tomatoes and a Creole butter sauce. With Jazz playing in the background, if we closed our eyes we could be on Basin Street in New Orleans. We also indulged in sides of Onion Rings, which were thickly sliced onions delicately golden with crispy breaded exteriors; Sweet Potato Casserole, which were whipped sweet potatoes topped with candied chopped pecans that were sweet enough to enchant without being cloyingly sweet; and Sautéed Spinach that was redolent with minced garlic and tossed with melted butter. Desserts are a must in New Orleans, and we carried out the ritual by sharing a dessert of "Grandmere's" Comfort Custard, which was listed on the menu as Heavenly vanilla custard that is a Brown family tradition. 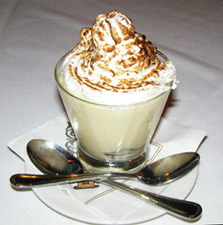 Topped with piped meringue, it was just the right finish to an excellent evening of dining. Service is attentive, portions are ample, and take-out bags are encouraged so that patrons can continue the experience at home. As they say in New Orleans, Laissez les bon temps roulez (Let the good times roll), at Marsha Brown Creole Kitchen and Lounge in New Hope! Read Chefs’ Recipes where Chef Caleb Lentchner shares his recipe for Seafood Court Bouillon - Creole Style Bouillabaisse .